At the No 3 reactor workers stopped high pressure coolant injection because of concerns about leakage, yet failed to arrange for water to be pumped in as an alternative cooling method. Both these errors (and others) contributed to the core meltdowns. (RCIC) system of the No. 3 reactor stopped at 11:36 a.m. on March 12, the day after the plant was hit by a massive tsunami triggered by the Great East Japan Earthquake, causing the water level in the reactor to decline. Note: no mention that the residual heat removal system was probably completely dead, which neccesary to remove heat from the injected water over extended periods with heat exchangers since cooling for the pumps as well as the pumps need AC power. RCIC is a feedwater pump meant for emergency use. It is able to inject cooling water into the reactor at high pressure. It injects approximately 2,000 L/min (600 gpm) into the reactor core. It also takes less time to start than the HPCI system, approximately 5 seconds from an initiating signal. It has ample capacity to replace the cooling water boiled off by residual decay heat, and can even keep up with small leaks. Arrival of the tsunami would have changed all that. All electric power went out; this means loss of all AC power for all the pumps in the plants. DC power, via batteries, was still available and there was at least one system that could be used in this case to provide some core cooling with no available electrical power. 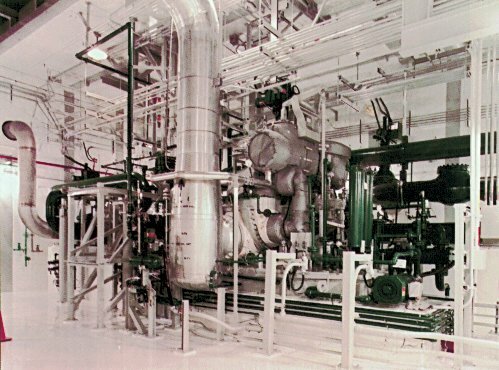 This system, using steam from the reactor to drive a steam turbine water pump, is called RCIC or the Reactor Core Isolation Cooling system. Operation of this system requires only station battery power. See below. The high-pressure coolant injection system is the first line of defense in the emergency core cooling system. HPCI is designed to inject substantial quantities of water into the reactor while it is at high pressure so as to prevent the activation of the automatic depressurization, core spray, and low pressure coolant injection systems. HPCI is powered by steam from the reactor, and takes approximately 10 seconds to spin up from an initiating signal, and can deliver approximately 19,000 L/min (5,000 US gal/min) to the core at any core pressure above 6.8 atm (690 kPa, 100 psi). This is usually enough to keep water levels sufficient to avoid automatic depressurization except in a major contingency, such as a large break in the makeup water line. Versioning note: The BWR/6 replaces HPCI with high-pressure core spray (HPCS); ABWRs and (E)SBWRs replace HPCI with high-pressure core flooder (HPCF), a mode of the RCIC system, as described below. The Automatic depressurization system is not a part of the cooling system proper, but is an essential adjunct to the ECCS. It is designed to activate in the event that the RPV is retaining pressure, but RPV water level cannot be maintained using high pressure cooling alone, and low pressure cooling must be initiated. When ADS fires, it rapidly releases pressure from the RPV in the form of steam through pipes that are piped to below the water level in the suppression pool (the torus/wetwell), which is designed to condense the steam released by ADS or other safety valve activation into water), bringing the reactor vessel below 32 atm (3200 kPa, 465 psi), allowing the low pressure cooling systems (LPCS/LPCI/LPCF/GDCS), with extremely large and robust comparative coolant injection capacities to be brought to bear on the reactor core. The low-pressure core spray system is designed to suppress steam generated by a major contingency. As such, it prevents reactor vessel pressure from going above the point where LPCI and LPCS would be ineffective, which is above 32 atm (3200 kPa, 465 psi). It activates below that level, and delivers approximately 48,000 L/min (12,500 US gal/min) of water in a deluge from the top of the core. 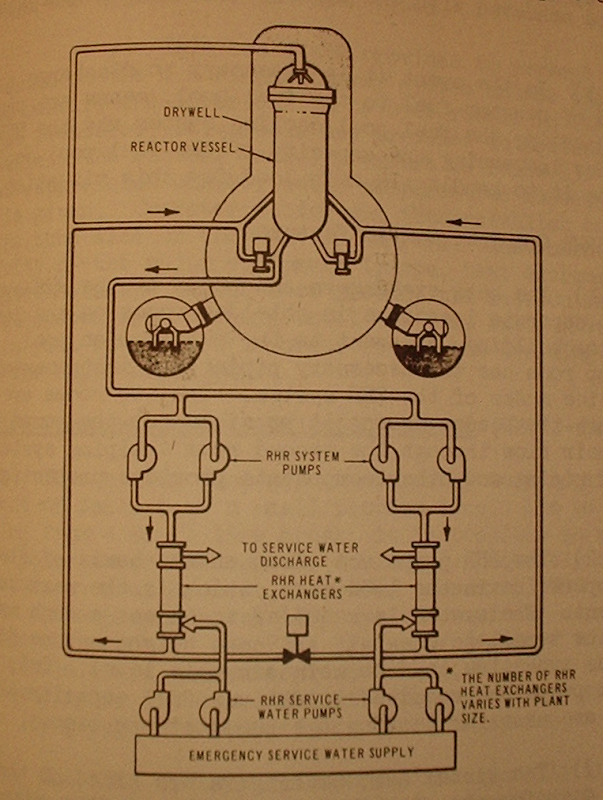 The low-pressure coolant injection system, the "heavy artillery" in the ECCS, can be operated at reactor vessel pressures below 465 psi. The LPCI consists of 4 pumps driven by diesel engines, and is capable of injecting a mammoth 150,000 L/min (40,000 US gal/min) of water into the core . Combined with the CS to keep steam pressure low, the LPCI is designed to suppress contingencies by rapidly and completely flooding the core with coolant. Unfortunately most of the components of this system are in the reactor building, which for the three Fukushima plants is not only heavily damaged but now a very high radiation area. 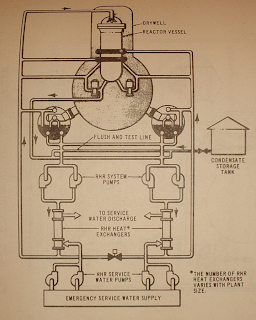 Above is the RHR or Reactor Heat Removal system. This is really a flexible system, with numerous valves (not shown) and various inlet and outlet pipes so that the system can perform a number of different functions as needed. The system can partially reflood the core (LPCI or Low Pressure Coolant Injection function), perform cooling of the containment (the drywell, that is) or it can be operated as a shutdown cooling system. 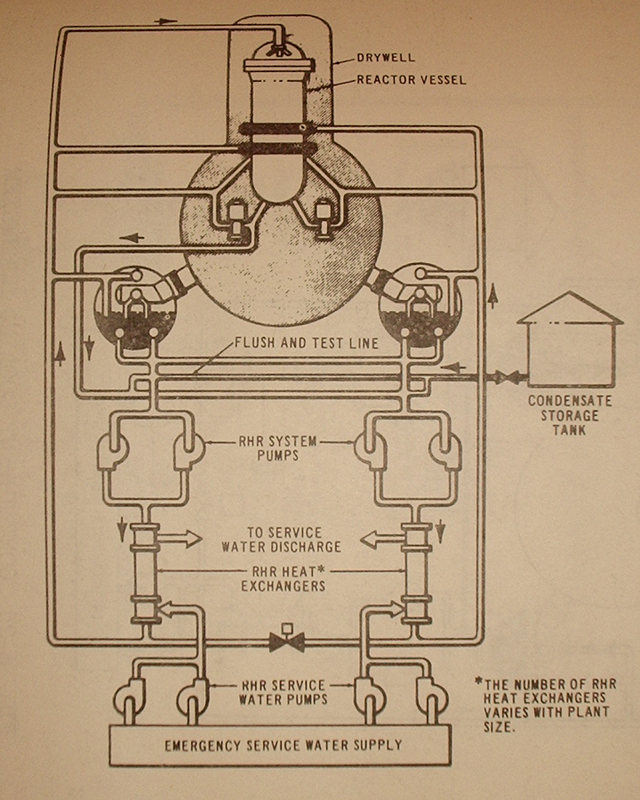 Above, and again from WASH-1082 we see the system configured for Shutdown Cooling. Note the flow that taps off of a recirculation pump. The system can be split during a normal shutdown process so that part of the RHR system is providing core cooling while the other is providing makeup water, essentially the LPCI function to keep core water level the same as the reactor cools down. 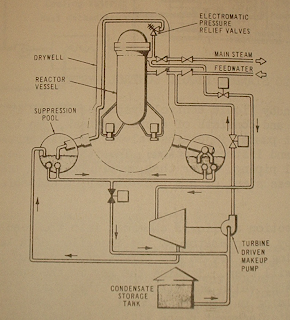 Note that all of this requires AC power for pumps, and note again that the RHR System Pumps and RHR System Heat Exchangers are all in the reactor building. Moreover, cooling for a number of pumps is provided by a Reactor Building Cooling Water system, which is also electrically powered. Engineers generally plan out counter-measures in such a way to ensure that there is a fail-safe for any kind of situation, in this case it was their "last fortification" to protect against the unknown. With this in mind, it is hard to imagine that they would design the power plant without some kind of back up emergency power support plan to protect against power loss or malfunction. Having followed my hunch to begin researching this further, just as I had expected, I was able to find what they had designed as their “last fortification”. The coolant systems acted just as they designed to. They each lasted for and performed their duties for their respective times as just mentioned. Engineers also knew that this was the “last fortification” left in place to keep the reactors under control and if they could not get regular operations back under control within these time frames there would be nothing left other than dump water into the reactors. 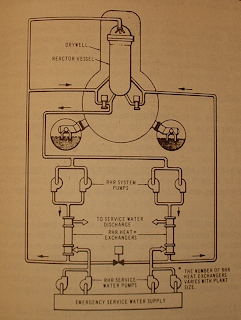 25 tons of water per hour would be required to manually cool down the core in reactor No.1. However, the freshwater stored in the water tank was not sufficient enough. The only readily available sufficient quantity of water was that of the sea. Thus, there was no choice other than to use that sea water to cool down the violent core. (Reactor Pressure Vessel: RPV). It is a click of the image and a zoom. Q. On March 12, a little after 7:00pm, workers started to pour seawater onto the core. This means that it took them even after the situation had become out of control it still took them an additional 20 hours to decide what to do. What could have possibly taken them so long to deliberate on the situation? Prof. Yamaguchi : The reason is because if you pour seawater onto the core, it will ultimately decommission them. I doubt that the plant sites were officially given permission to dump seawater onto the cores even though they said they did. Through pouring seawater onto these cores it would cost millions or even billions of yen to replace the destroyed core. Even if workers were to have made a judgment call and done so, they probably would have been fired for doing so, as the costs involved were so tremendously high. Such a high level decision cannot be made without the top level of clearance from top management. If we think about it this way, it is natural to see that all the necessary information in making the decision had already been presented to the Chairman, Mr. Katsumata, and the President, Mr. Shimizu, at the time. That means that the executive managers had hesitated as to whether or not go through with decommissioning the reactors for a period of 20 hours before actually deciding to do so. Without being able to find any alternatives, it was already known without a shadow of a doubt that the reactor was no longer controllable. What's more surprising is the fact that even after they decided to pour the water onto the first reactor they continued to deliberate for an even longer time before injecting seawater onto the second and third reactors. This clearly shows a clear sense of negligence on part of the TEPCO management even with regard to criminal law. They certainly have put themselves in a position which bears a heavy burden and responsibility from here on out. Chart note : The pressure in the Pressure Vessels and water levels of the reactors according to the time line in the No. 1, 2 and 3 reactors of the FukushimaNo.1 Power Plant. They were originally designed to withstand pressures of up to 4.2 atm in the first reactor, and 3.8 atm in the second and third reactors, respectively. Zero or less than zero on the water level meter for the Pressure Vessel means that the nuclear cores have become exposed outside of the water. 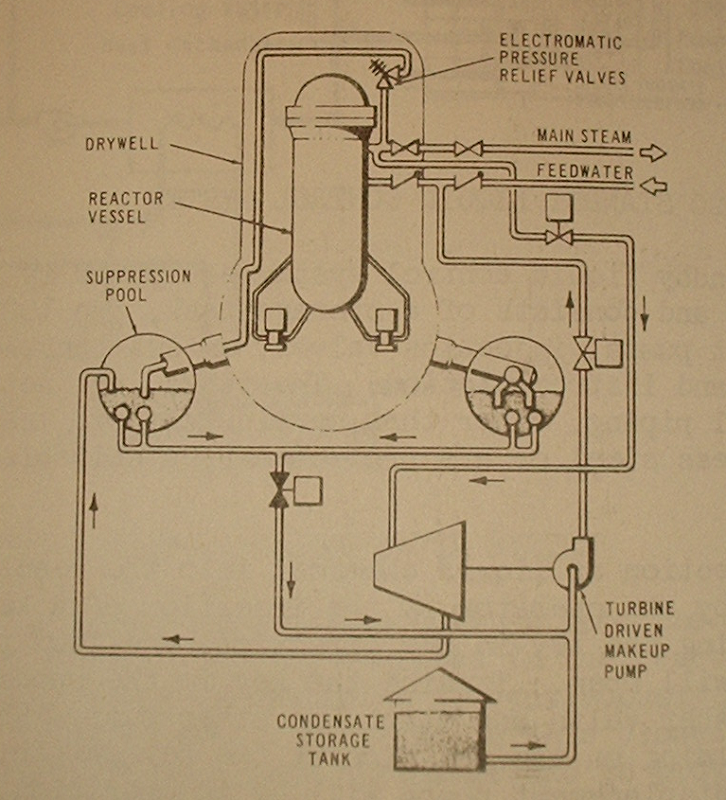 The blue area depicts the time when the isolation composer (in the No.1 Reactor) and reactor core isolation cooling system (RCIC in the No.2 and 3 reactors) were considered to be functional. The data of the water level of the reactor between March 12 at 19:00 and March 13 at 13:00 was apparently missing. However, the data from the prime minister's office showed that the water level had started to decrease from 4:15, thus, the information was used to group the No.3 reactor in the dotted lines based on a simulation of the information provided with regard to the No.2 reactor. Q. At the time of the disaster, there was an indication that the seawater injection had been somewhat delayed, am I right? Prof. Yamaguchi : Some said that there was venting trouble, but even so the equipment seemed to be in good enough working condition to divert the water onto the core. The cause of the disaster can be attributed to poor planning in placement of the diesel power generators as well as insufficient preparation for damages from the tsunami. However, these were not necessarily the primary reasons for this disaster. The ultimate essence behind what brought about this disaster is simply the fact that the technology management made a mistake in their planning due to their inability to understand what the consequences of a controllable versus uncontrollable state were. If this holds true, then I feel that this disaster has been the result of the same error which caused the 2005 JR Fukuchiyama Line Train Accident. two days later, on May 15, TEPCO held a press conference where they released the data regarding the water levels in the reactor vessels and pressure levels of the reactor containers. The following days newspaper headlines read “the meltdown began right after the impact of the tsunami” and “TEPCO admits that the fuel rods have already melted down”. After gathering all of the articles I could find related to the accident I concluded that the story would eventually end up as something like “There is a high possibility that the earthquake was responsible for causing a crack which lead to water falling onto the exposed fuel rods” or “Even though fresh water was injected, the exposed fuel rods still underwent a meltdown”. Most of the articles published by the press regarding the meltdown were published after the press conference. However, what TEPCO wanted to express in this conference was that “the earthquake was the primary reason why the accident occurred”. Although, I suspected that this was probably a mistake once again with the “technology management”, it seemed that TEPCO was trying to place the blame on the earthquake instead. I felt very surprised after reading that. The data that was provided regarding the water and pressure levels was the same as what had been previously released, but I started to find many “attention” comments in small letters in the graphs. In summary “there was a possibility that the measurement equipment had not been functioning properly at the time the data was collected. Therefore, the data in the graphs were not based on the actual data, but rather on calculations based on several different sources of information available”. In addition, the factors, such as “hypothesis”, “estimation”, and “temporary analysis” etc., were inserted all over the place. Thus, it can be said that although the data was not exactly false, it also did not provide us with the exact truth either. Even if the information from the simulation was accurate, the press would more than likely misunderstand and misinterpret the situation as “although it is unfortunate, we will just have to accept that there is only simulation data available with regard to the disaster”. I felt shocked to find out that TEPCO had decided to be so sneaky as to intentionally release ambiguous information. At that time, I really felt a strong sense of urgency, as though it were my mission, in needing to find out the facts and get them to the public as best I could.